Although she is considered one of the best ballerinas today, Suzanne Farrell started out, like most, in the corps de ballet at the New York City Ballet when she started there in 1961. She quickly moved up the ranks and is widely known for her performance as Dulcinea in George Balanchine’s Don Quixote in 1965, but was not considered a principal dancer until she was cast in Agon at the Paris Opera. Farrell retired as a dancer in 1989 after a long career at 44 years old to become a teacher and eventually start her own company at the Kennedy Center. Suzanne Farrell became a phenomenal dancer. Her career lasted around 28 years which is longer than those of most dancers. 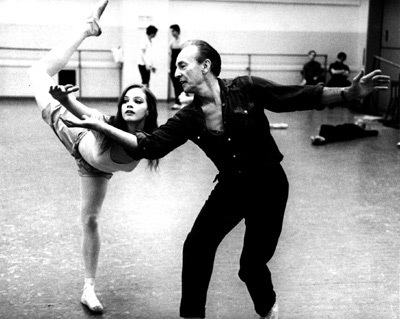 It is said that she was Balanchine’ “muse” and that is why he danced with her on the opening night for Don Quixote. It is also said to be the reason he created so many ballets for her. Its speculated that he divorced his wife to try and be with her, but she was a strong catholic and married a fellow dancer. The NYCB actually dismissed her from her teaching position which freed her to work with ballet companies world wide. After her travels, she settled at the Kennedy Center where she continued to teach the ways of the great George Balanchine.